Is the Christian Universalist Association Right for Me? Millions of people today feel spiritually homeless. 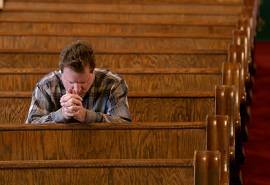 They do not agree with the dogmatic and exclusionary attitudes of many conservative churches, but they are unsatisfied with the lack of spiritual depth and belief in many liberal churches. If you feel this way, you might be struggling to find a community of faith you can feel comfortable in, or you might have given up on organized religion entirely. The Christian Universalist Association encourages you not to give up. There are many positive benefits for your life and your family of finding a group of people you can share your faith with and learn with, who care about you, will help you in difficult times, and want to walk with you in your spiritual journey. If you, like us, seek to follow the path of Jesus without a lot of outdated and restrictive doctrinal baggage, our organization might serve your spiritual needs and be a place you can feel at home. Our overall philosophy is one of inclusiveness and open-mindedness combined with strong beliefs and principles. We respect your individual conscience and your own personal relationship with God, so we do not try to tell you exactly what to believe about everything — as if any human being could ever know! But we do not fall into the relativistic trap of saying “all beliefs are equally true,” which is absurd. Many churches go too far to one extreme or the other. They either fail to take a stand for essential spiritual teachings of the Gospel — things such as the existence of God, the authority of Christ, the reality of life after death, the fact that there are mysteries that transcend the knowledge of science — or they stand for things that are not essential, or in some cases, are even contrary to the spirit of Jesus: Political activism, whether liberal or conservative, as a main purpose of church. Narrow-minded refusal to see the good in other religions and philosophies, or politically correct refusal to see the bad in any tradition that people happen to believe in. Focusing on very specific and divisive doctrines and practices, such as literal creationism, the “Rapture” and apocalypse, speaking in tongues, faith healing, tithing, Old Testament laws, support or opposition to homosexuality, etc. And most troubling of all, the Biblically inaccurate, morally repulsive idea that God will damn some people to hell for eternity, because of sins committed during one mortal life — or even just because they chose the wrong religious beliefs. The Christian Universalist Association is different. We take a stand, and we stand for what really matters: A God who loves all people unconditionally with a parental love. A divine plan of growth for all God’s children, as we learn from our mistakes and progress to higher levels of understanding and perfection. A destiny of salvation, reunion, reconciliation, and oneness with Christ that will someday be manifested for everyone ever created. A spiritual community that can help people to reach their true potential — no matter who you are, where you come from, what you have believed, what you have done. There are thousands of different religious organizations today, strenuously competing for our attention and allegiance. There are denominations with all kinds of detailed creeds, denominations with no creed at all, and denominations with a creed that few of the members actually believe anymore. There are churches that focus on “tattoos and piercings for Christ,” and churches that believe tattoos and body piercings are “of the devil.” There are churches that handle snakes, churches that drink wine, and churches that hate serpents and alcohol. There are New Age gurus that believe they are hearing messages from angels and ascended masters, and Pentecostal preachers that believe they are prophets filled with the Holy Ghost. There are lots of churches that believe the Bible is the only source of truth, and lots of mosques that believe the Koran is the only source of truth. There are some congregations that prefer reading neither the Bible nor the Koran, but do yoga and discuss philosophy. Maybe you have tried or considered some of these options. Or maybe you were brought up in one type of religion and have fallen away from it because it no longer makes sense to you — but you are not sure where to go next. Amidst all the cacophony of possibilities, the Christian Universalist Association offers you something you will have difficulty finding somewhere else: peace of mind. The centerpiece of our spiritual perspective is Universalism, and this teaching was brought by Jesus Christ — a revolutionary view of spiritual reality in which we can honestly call God “our Father in heaven,” and expect that He will raise us up to maturity like the greatest father we could ever imagine: with infinite patience, forgiveness, compassion, and wisdom. We believe in a God who never gives up. Nobody is “lost forever”! Our faith is built on trust that the universe always works according to a benevolent divine plan — a trust that Jesus had and imparted to his followers in the Gospel, and demonstrated through the sorrow of the crucifixion and the glory of the resurrection. The Christian Universalist Association focuses on that message of trust in a benevolent God and a glorious divine plan for all people. This is what is taught in churches that support our organization. In the CUA, you will be given ample freedom to grow closer to God in your own way, but will be led in a positive direction. Please join us in the journey!